An SEO company should know better to mess with other SEOs, shouldn't they? Well, they don't always think before they act. 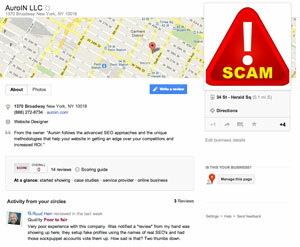 Scott Hendison uncovered a SEO company that is faking their location in Google+ Local but even worse, they had over 60 reviews and many from well-respected SEOs vouching for their SEO services. Including reviews from people like Jill Whalen, Loren Baker, Larry Kim, Ross Hudgens and many more, of course including Scott Hendison. How they did it? I didn't look before Google removed the fake reviews. Plus all of the reviews were almost perfect, having a 29 out of 30. So what happened? Scott posted this on Google+ (also to extended circles) and the SEO community attacked. They left bad reviews, outed this guys efforts and the Google+ Local page was marked as spam, the reviews were pulled and this company is looking pretty bad now. To me, it is a bit scary that someone can fake a review from my name without me knowing about it. Note, there is a way to check the reviews you added via Google+, so it is good to check that every now and then. I am not sure if the reviews were from fake Google+ accounts or somehow they were able to trick Google into thinking a real Google+ account added those reviews. Update: This guy created fake Google+ accounts for these SEO personalities, so their accounts were not hacked into.